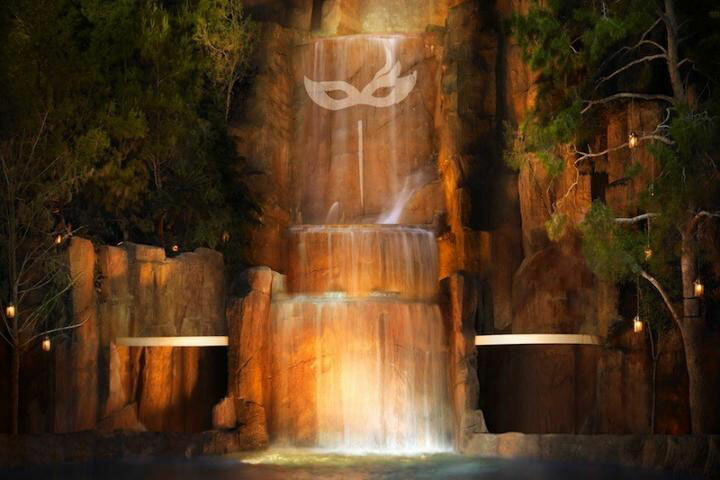 Intrigue nightclub at Wynn features a 94-foot waterfall outside. When you think about Vegas nightclubs, you probably think of the massive megaclubs that are filled wall to wall with people dancing to the biggest DJs in the world. The new Intrigue nightclub at Wynn wants you to think about nightlife in a slightly different way. You won’t find hordes of people here and you probably won’t be listening to the hottest celebrity DJ. Instead, you’ll be having a much more intimate and luxurious experience with top-notch service. The 14,000-square-foot club, which hosts its grand opening Friday, only holds about 1,200 people and the club will be spinning party music spanning several genres, designed to get you out on the dance floor. Intrigue is, well, intriguing from the minute you walk in. To get to the club (which is in the space formerly occupied by Tryst nightclub) you descend a staircase and enter a hallway with white walls that can have images, company logos, photos or different colors projected on them. The club might look totally different each time you visit. The end of the hallway opens up onto the main room of the club, which also features white décor and beautiful chandeliers, including a large illuminated fixture hanging over the dance floor. Tables are tiered to maximize views of the DJ and dance floor and there are two bars – one on each side of the room. The tables feature storage drawers (a great perk for the ladies with purses) and phone chargers for every type of phone imaginable. The main room also offers stunning views of Intrigue’s outdoor patio. The patio features more tables, another bar and funky chandeliers hanging from the trees. Yes, there are trees outside, as well as a 94-foot-tall cascading waterfall. The waterfall flows into a small pool of water that will feature fountains and pyrotechnics. While most of us will be partying in the main room, Intrigue also has a very swanky private VIP, invite-only room that’s like a club within the club. Adorned in rose gold and white, the private room has its own bar, its own restrooms, a private entrance from Lakeside restaurant, keyed lockers for your valuables and a one-way window. This allows guests to look out over the club without people in the club being able to see in. There’s also a large-screen TV that can show guests in the private room a live feed of what’s going on out in the club’s main room. If you wanted to have your own live DJ music here, that can also be arranged. Besides the music and atmosphere, cocktails are one of the most important parts of a club and Intrigue won’t disappoint. You’ll find interesting drinks like the Platinum Donkey – a variation of the mule cocktail – made with Stoli, homemade ginger syrup and topped with Fever Tree sparkling water. Need something to keep you partying until dawn? Try the Up All Night – an espresso martini meant for sharing that’s served in a crystal fountain. It’s made with Cruzan Single Barrel, Licor42, Disaronno and nitrogen charged espresso. If you choose to indulge in bottle service there will be some creative delivery options including “angels” and a masquerade parade. If that sounds like a spectacle, just wait. There will also be a performance aspect to the nightclub featuring singers, dancers and other surprises. In fact, Mark Shunock was hired as Intrigue’s creative director. He’s an actor and singer known for starring in the Vegas show “Rock of Ages” so he knows a thing or two about keeping audiences entertained. Intrigue can also be used for shows like the upcoming Seal concert on May 21st. The concert will take place in the club before it opens for the evening. If it sounds like Intrigue is going to be unlike any other club out there, you’re right.